Featuring the premiere of Precarious, June 1-3 at CounterPulse; the 2017 Bridge Project, Radical Movements, November 10-11; and the inaugural Community Engagement Residency with Julie Tolentino. Hope Mohr Dance developing Precarious. Photo by Margo Moritz. SAN FRANCISCO, March 10, 2017 – Hope Mohr Dance (HMD) announces its 2017 season featuring the premiere of Precarious, June 1-3 at CounterPulse; the annual Bridge Project, Radical Movements: Gender and Politics in Performance, November 10-12; and the inaugural Community Engagement Residency led by Julie Tolentino. To celebrate a decade of creating, presenting and fostering outstanding art at the intersection of critical thinking and the body, Hope Mohr Dance presents two seasons of work that respond to the current local cultural moment. The recent election and San Francisco’s current gentrification boom threaten the city’s identity as a progressive, inclusive city. “In this environment, I feel an acute responsibility to be both artist and advocate,” Artistic Director Mohr states. Mohr is developing Precarious not in the safety of a hermetically sealed studio, but in relationship to one unique place: Klockar’s Blacksmith Shop, at 443 Folsom in San Francisco. In operation since 1912, the blacksmith shop has a dirt floor and is packed with rusty tools and ancient machinery. The small wooden building is surrounded by condos, skyscrapers, and loud construction sites. 443 Folsom has also been home to a visual artist, Tracy Taylor Grubbs, who works out of the second floor. Mohr and Grubbs share an improvisation practice. The day after the election, Mohr learned that the building would be converted into a cannabis start-up in 2017. Painter Grubbs was evicted in February. In response to the building’s conversion, Mohr re-framed Precarious into a unique event beginning on the sidewalk in front of 443 Folsom and ending at CounterPulse. 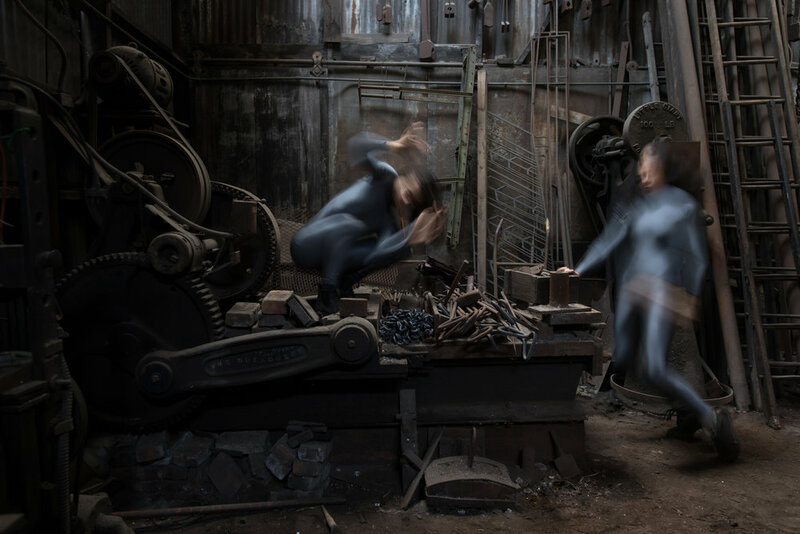 In collaboration with the public historians at Shaping SF Walking Tours, she's creating a labor history walking tour culminating at CounterPulse with a performance of intense physicality inspired by the vulnerability and vitality of today’s city. The CounterPulse gallery will host an exhibit by Tracy Taylor Grubbs, the artist being evicted from 443 Folsom. The 2017 Bridge Project, Radical Movements: Gender and Politics in Performance, will bring together artists and activists in a series of performances, conversations and workshops for gender justice and in response to the question: What does it mean to have a radical body? As part of its 2017 Bridge Project, HMD is pleased to announce its inaugural Community Engagement Residency, a year-long artist training led by Julie Tolentino resulting in the creation of new works of performance. The culmination of Tolentino’s residency will premiere as part of the Radical Movements program in November 2017. The mission of Hope Mohr Dance is to create, present and foster outstanding contemporary dance at the intersection of critical thinking and the body. In keeping with these commitments, HMD’s signature curatorial platform The Bridge Project approaches curating as a form of community organizing to facilitate cultural conversations that cross discipline, geography, and perspective. The Bridge Project “annually recruits the prime movers of American post-modernism in a series of classes, workshops, discussions and public concerts” (San Francisco Chronicle) and“fills a critical gap in the artistic and intellectual life of the Bay Area dance community by honoring the past and giving context to the present” (Stanford University Professor of Theater and Performance Studies Janice Ross). The Bridge Project’s track record of presenting high-caliber artists has raised HMD’s profile as a company that does more than present the work of one artistic director, but rather serves as a hub for artistic exchange. Hope Mohr is a curator, choreographer and writer. She trained at S.F. Ballet School, studied theater at Yale and earned her B.A. in Latin American Studies at Stanford, where she wrote her honors thesis on the women's movement in Nicaragua. After working as an Americorps Team Leader in South Central LA, Mohr moved to NYC to train on scholarship at the Merce Cunningham and Trisha Brown Studios. Her long performance career included time in the companies of dance pioneers Lucinda Childs and Trisha Brown. Passionate about pursuing both community organizing and dance, Mohr earned a J.D. from Columbia Law School, where she was a Columbia Human Rights Fellow. In 2007, Mohr returned to San Francisco to establish Hope Mohr Dance. The ongoing mission of the company is to create, present and foster outstanding outstanding contemporary dance at the intersection of critical thinking and the body. In addition to making dances that take a rigorous conceptual approach to fundamental questions about the body in space and time, Mohr curates as a form of community organizing. Her signature curatorial platform The Bridge Project recruits the prime movers of postmodernism to the Bay Area to spark conversations that cross discipline, geography, and perspective. Mohr has held residencies at Stanford Arts Institute, ODC Theater, Montalvo Arts Center, and the Interdisciplinary Laboratory for Art, Nature and Dance. She is a 2016 YBCA Fellow.